As part of Team Abnegation UK (a book blogger challenge), I was treated to an Advanced Review Copy (ARC) of Insurgent – thanks HarperCollins. I only received my copy on Wednesday but being selfless (as the abnegation are) I still made it a priority to read the book so that I could review it for you today. 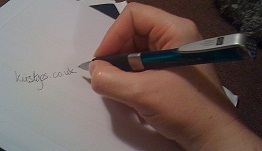 In the process I managed to cross another thing off my Bucket List. But, if you have already read Divergent and haven’t got time to read it again before Insurgent (I didn’t but wish I had) – the lovely lady herself has been kind enough to provide a summary of what happened in the first book here. 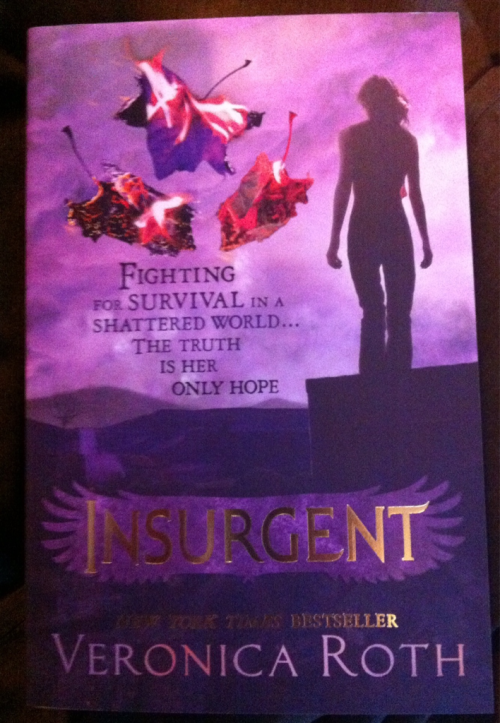 I’m afraid I’m going to find it really hard to review without some spoilers for Divergent if not Insurgent. I’ll try really hard not to give away everything but if you prefer not to read the review it is contained within the stars below. Insurgent picks up exactly where Divergent left off with Tris and Four/Tobias and ‘whoever else was with them’ on a train on their way to the Amity compound and the action is pretty much non stop from then though there is food and sleep mentioned ;o). In Divergent we only really got to meet three of the five factions – Abnegation (the selfless) where Tris was raised, Dauntless (the brave) where she transfers to and Erudite (the intelligent) where her brother Caleb transfers to. They are also the faction responsible for the devastation at the end of Divergent. In Insurgent we get to visit the headquarters of all factions and find out more about Amity (the peaceful) and Candor (the honest) in the process. We also find out that the factionless are more organised than they have clearly been given credit for. Tris is dealing with the repercussions of what she did during the Erudite controlled Dauntless simulations as well as what happened to her parents and old and current faction members. I think it is more evident to us in this book than the last that she is only 16. She is impatient and impulsive but also inquisitive and she shows her Abnegation roots by her numerous acts of selflessness. It’s unfortunate that these acts usually see others placed in danger too. Tris and Four do not have a love triangle to contend with but they also do not have a smooth ride as a couple and both keep secrets that threaten their relationship. Divergence is seen as a massive threat by the Erudite and, not content with trying to wipe out Abnegation, they try to determine a way to control or eliminate the Divergent. We find out that Divergence is more rife than we first thought and that means something for the future of society as Tris knows it. She knows her parents wanted to let everyone know the truth and Tris doesn’t want their deaths to have been in vain. Now I had kind of guessed what the truth might be but that didn’t spoil the big reveal for me (and I got a little confused at one thing – hence the recommendation to re-read Divergent if you can or have a better memory than me). I’m really looking forward to seeing that truth open up a whole new avenue for exploration in the as yet unnamed trilogy concluder. As with Divergent I have selected a few of my favourite quotes to illustrate some of the themes/images that stood out for me with a little explanation why. His breaths, my breaths, his body, my body, we are so close there is no difference. As I mentioned in my X post there are some slightly raunchy scenes in Insurgent where Tris and Four get a little bit steamy. For Tris these moments with Tobias are her escape from the collapse of society around her and this line represents that perfectly. She never lets herself escape completely though and Tobias remains the perfect gentleman. …even more difficult to justify my feelings with no evidence except my intuition. So I agree. But I do not change my mind. Often quotes jump out at me because they may resonate with my life outside the book. To me this demonstrates the difficulties many of us face with a lack of acceptance of certain forms of knowledge. That thoughts and feelings and intuition are still not as accepted as what we can see or add up. Tris has no idea what the ‘truth’ may be but she ‘knows’ that it needs to be set free. This made me giggle – Tris asks this almost indignantly of another character but it just made me crave a mash potato sandwich. I’ve not had one for a good few years now. Blood is a strange color. It’s darker than you expect it to be. Obviously this comes at a point when Tris has already seen more than her fill of blood but to me it acknowledges her humanity. Death doesn’t become easier for her to accept just more of a reality. I don’t stare back – I refuse to stare back. Just love the contradiction in this. When we really try to stop ourselves we just can’t help giving in to what we are resisting. I’ve been someone who has battled crying all my life, crying when I am sad, angry or sometimes with relief (A-Level results) or in pure fear (The Woman in Black). I am coming to terms with the fact that this is necessary for me, even though it sometimes makes others uncomfortable. I even have times when I haven’t cried for a when I feel an overwhelming need for a good blub. I love how Veronica through Tris justifies the necessity of this act for me. I think they’re going to force us to eat lots of cake and then take an unreasonably long nap. In the face of fear what is the best course of action – laugh. Tris lies to a Candor born Dauntless and comes out with my idea of heaven. Over the week the rest of my team will be reviewing the book on their respective blogs – you can find a list of them on this post here. Or just admire my copy of the book from the day it arrived. I strongly suggest reading it though. 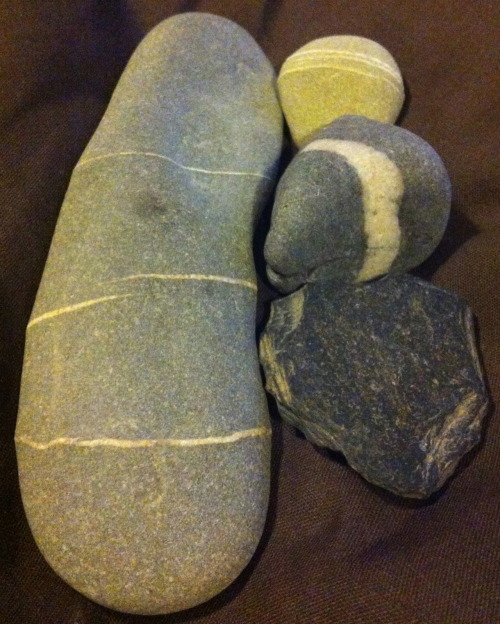 Finally in honour of today my 366 Photo (incidentally 1/3 of the way through the challenge) represents the grey stones of Abnegation. 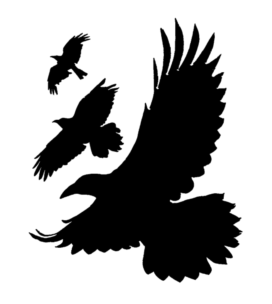 I’d really love to hear what you thought of Insurgent in the comments – as a consequence readers please be aware the comments may contain spoilers. 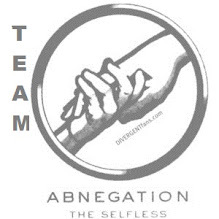 In honour of Abnegation I’d also like you you tell me what selfless acts you’ve performed recently. Mine usually revolve around letting people out in front of me in the car or helping people with their IT related difficulties. Posted on May 1, 2012, in Book Reviews, Bucket List, Reviews and tagged Book Review, Books, Divergent, Insurgent. Bookmark the permalink. 5 Comments. Great review! Those quotes there are some of my favourite from the book so thanks for including them. 🙂 I loved this book too! Thanks Sam – I still keep giggling at the thought that Veronica used mash potato sandwiches in the book. I’m really looking forward to finding out the truth too!